We all want to generate more business right? Silly question I know, but based on the conversations I have with other originators we also want to generate this new business quickly , without much effort, and of course with NO OUT OF POCKET cash. So let me share with you 5 ways you can generate new deals and relationships quickly and without spending any money. Honestly, I know what it’s like to have a ton of money and I also know what it’s like not to have any at all. FIRST THOUGH- A REALITY CHECK…. Sorry – I just have to get this off my chest. If you truly want to succeed you MUST invest in your business in 2 ways. First – You must invest in education about the industry and also about marketing -salesmanship and persuasion. To say it a little more simply, you must know your programs and guidelines and you must also know how to “sell yourself” and persuade others to use you instead of your competition. I actually have an entire course on this called the LOAN OFFICER UNFAIR EDGE that tells totally with the psychological part of our jobs and persuasion tactics that few others know. Second– You must invest in marketing. The good news is that if you are one of my Top Originator Mastermind members or subscribers than you already have been exposed to marketing that makes every penny you invest accountable and trackable to you. It’s Ridiculous to be in business and think you will make six figures without investing in your own business. I suggest setting aside 10% of each paycheck to invest in your business. You can also take out a loan and view it as a business loan or educational loan. That will motivate you to MAKE IT HAPPEN! Ok -now that this topic is off my chest let me share 5 simple and fast – no cost ways to start generating some new business and relationships. While the whole world is now communicating with texts , instant messenger , and other on-line and impersonal methods, why not go ahead and be different. Go old school for a change. Pick up the phone and hold an actual conversation with an agent or a potential referral source. Write them a letter and mail it. Yes, there are actually still mailboxes scattered around your city. Go meet them in person and have a conversation so you can find out if you are a good fit and can work together. Get in your car and drive to them or have them meet you in your office. Actually one of the best methods is getting active in your own Board of Realtors and home builders associations. Call and visit or write a letter to agents and referral sources you haven’t worked with in a while. Write a letter to your past clients or call them to see how they are doing and if they know of anyone who they can refer you to? I have always been active in many charitable organizations and have been president of many of them. I don’t mention this to brag, but rather to tell you that when you do good, good things happen. Get active in your religious organization, schools, civic organizations and others. While doing good let people know what you do for a living. You will likely also find many professionals, including Realtors, Builders, Financial planners and attorney’s who are also active. The beauty of this idea is that you are building relationships with other charitable and good people. You have a mission in common. You will now get to know them personally because of your involvement. These are people you would likely never ever meet or get to know under any other circumstance. This strategy also allows you the opportunity to get some great free publicity and while that should not be your sole motivation it certainly is a good result. This is one of the top NO COST methods to position yourself as an expert. No begging or expensive lunches. Find a great topic and teach. For example I teach a course to Realtors for continuing credit hours on How To Sell More Homes To Boomerang Buyers and Others With Credit Challenges. Yes, lunch and learns and office meetings are also great. But they require you to buy food and incur other expenses. When you teach continuing credit hours, the Board of Realtors pays for advertising the class to fill it up. You use their conference room or facility and they issue the continuing credit hours. You show up – teach for 1.5 hours and you will leave with that group of Realtors seeing you as an expert. Simple and Powerful and zero out of pocket. This is one of my favorite strategies but it does require some expertise in a specific niche and knowledge of how the media works. All media outlets, including radio, television, print publications and on-line websites are always searching for new stories. Your job is to present them with the story that has a hook. For example, Let’s say you are the expert in working with Credit Challanged or Boomerang Buyers like I am. Another idea is just to comment and give your take on what’s happening in your local market or to the interest rate markets. You could contact the editors or publishers and offer to provide them with an interview or statistics or an article on how buyers can now purchase a home one day after a bankruptcy, foreclosure, or short sale. You could also be a guest on a local TV news station, or a radio show as I have done. In fact, I have been on 42 radio shows and helped over 29 other originators set up and structure their own weekly radio shows so they dominate their markets. You could create a book on the topic and also have a weekly podcast. All of these position you as a celebrity but the key is having a great hook and also believing in yourself as the actual expert. There are websites out there that connect reporters with experts in different industries so they can be used as a resource when the Reporters need a story or a quote. Once you have this FREE PR make sure you use it in all of your marketing and promotional efforts. One of the things I find difficult is filling up a room with buyers who are wanting information about buying a home. The truth is that most of the time the Loan Officer , Title Rep and Realtor wind up eating the doughnuts and drinking the coffee waiting an hour, and then leaving bloated and disappointed at the poor turnout. If you live in an area where there are all 4 seasons than you also have the weather to contend with which often prevents people from coming out at all. When it’s nice they want to do outdoor activities and when its cold or snowing they also won’t come. You can use social media posts on Linked in , Facebook and even Pinterest to get people to attend your homebuyer workshops. Oftentimes, you will find better attendance than a live homebuyer session because people can remain anonymous and learn from the comfort of their homes. So there you have it. Five NO COST Ways to generate new relationships and business. Each and every one of these strategies I personally use and have taught to my members and subscribers and of course my coaching clients. But remember one thing- Once you do start generating new business start setting aside a special account so you can scale this. Take 10% of every commission check and put it into this account so you can continue to be seen as the GO TO Originator in your market. Try this and let me know your thoughts by posting below. BrianSacks- Are You Seeing These Too? For the past 3 years I have been telling everyone one of my subscribers and members that 2018 was going to be the YEAR OF THE BOOMERANG BUYERS. These are the buyers who had a credit challange like a bankruptcy or foreclosure or even a short sale during the meltdown. WOW – CAN YOU BELIEVE THAT WAS A DECADE AGO? I even created the BOOMERANG EXPERT PROGRAM to help my fellow originators profit from this explosive niche. 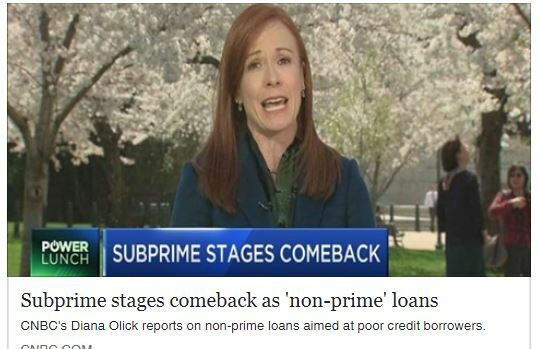 Little did I know that we would be seeing more and more of these “NON-PRIME” loans including those now for self employed buyers. But I took it off the market and only offer it to my private clients and coaching members. Of course if you have been a reader or member you already know the formula that I created to explode your production right? SO I AM WONDERING- ARE YOU SEEING MORE OF THESE BUYERS? could you please just take 1 minute to answer a 1 question survey….? 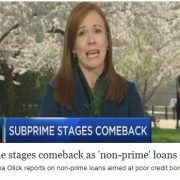 http://www.toporiginatorsecrets.com/wp-content/uploads/2018/04/subprime-comeback.jpg 349 539 Brian Sacks http://www.toporiginatorsecrets.com/wp-content/uploads/2016/12/8.png Brian Sacks2018-04-27 18:11:062018-04-27 18:36:05BrianSacks- Are You Seeing These Too? about this business and how it works. – Why Agents Will Chose One Originator over another when the one they choose is less competent? – Why Buyers get pre-approval letters from you but then shop your quote around and wind up using another company? – How to get past clients to refer you? – Why you kill yourself and your team to get a tough deal done – on time and yet never get another referral from that agent? I actually could go on for a few pages about all of the questions that have troubled me in this business but I am sure you have many you could add as well. It’s almost like the questions men ask about not understanding women and vice versa. BUT I WENT OUT AND TRIED TO FIND ANSWERS. See most of us think the key to success is running Facebook, or having coffee with agents , or going to offices to beg for business. Some will tell you that they have a script you can use. Well how’s that working out for you ? The real path to success is to understand WHY people do what they do … or don’t! Then you need to have the tactics and psychology in place to MAKE them do what you want and need to do. – ATTRACT instead of chase. That’s why I actually became a student of persuasion and learned from the best over the past 20 years. It’s truly like having an UNFAIR EDGE and once you have this edge you have the ability to actually control your business, your income and your life. I have also wondered why no one else in our industry has ever shared these tactics. I can only think of two reasons. First – they know them but don’t want anyone else to learn them? If that’s the case they are selfish and have a scarcity mindset. Or the most likely answer they simply don’t know these little known but career changing information. Actually there is a third- There are so called “gurus” who either never originated or did so 100 years ago and they would rather just have you buy their “tools” They use these secrets to get you to buy their materials. That is all of ZERO value if you can’t close them- and you can’t close them without understanding persusaion and WHY people will or will not choose you. Anyway- become a student of persuasion – it’s the most important skill you can have to grow your production. but I took this all a step further and show you how to use them in the mortgage business. Then I actually give you the actual tools I use everyday so you can simply copy and start using them immediately to explode your prodution and have the UNFAIR EDGE in your city. PS- BTW- here’s how to learn more about the program.